Laser Pigtails are designed for permanent coupling to a laser which makes their quality crucial. 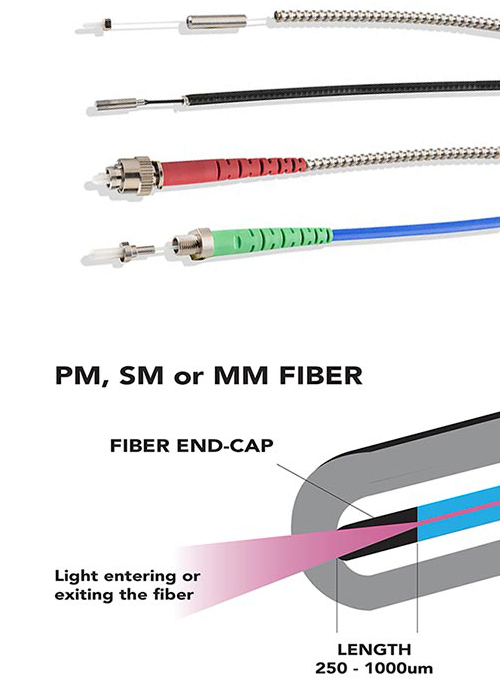 Typically, one side is a custom ferrule or capillary that is coupled to a free space laser beam while the other end has a fiber optic connector. On many pigtails, there is a feedthrough which secures the external cabling to the laser housing. Behind the feedthrough, 900um OD tubing is used for flexibility inside the chassis. Coastal Connections has standard feedthroughs for Laser Pigtails.